Sometimes it happens that recordings can be compared to waiting for a bus for a long time only for two to arrive nose to tail, and that is the case here. 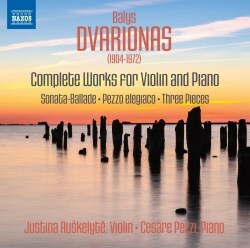 Two recordings of music for violin and piano from different labels, both of which include 6 of the same pieces by Lithuanian composer Balys Dvarionas and which even have similar designs as their cover art. After that they diverge as the Naxos disc concentrates solely on Dvarionas while the Delos disc then includes works by two other Baltic composers, Vasks and Pärt plus one by Georgian Giya Kancheli (Baltic and beyond indeed!). I must say yet again that considering the small size of the three Baltic States (Lithuania: population under 3 million; Latvia a shade under 2 million and Estonia only 1.3 million) they have produced a number of world-class composers whose contribution to music history is slowly being unveiled and which include the three here. Reading about Dvarionas I learned that he was one of eleven children born to an organist, all of whom were taught music from an early age with Balys going off to Leipzig to music conservatory at hew age of 16. Having studied for four years under the likes of Siegfried Karg-Elert and a further two years in Berlin studying piano under Egon Petri it is hardly surprising that he became one of the most significant composers in Lithuania of his generation. What struck me immediately with the very first piece was his facility with writing really memorable tunes the first of which has become my latest earworm; Pezzo elegiac from 1946 has a wonderfully bittersweet nostalgic mood about it that is compellingly attractive. After the main theme is stated the mood changes as it is treated to a folk inspired development before reverting to its original slightly sad state. It is followed on the first disc by what is described as his violin masterpiece, his Sonata-Ballade from 1965. The composer’s son Professor Jurgis Dvarionas, who wrote the booklet notes, says that there are themes within it that describe “lyrical dreams and romance” which conflict with those of “grotesque opulence (representative of socialist realism)”, but in any event it is easy to see why it is so highly thought of. Reading what motivated his music sounds like a clarion call in these dark times we are all living through today as he wrote: “...I believe in the musician’s vocational call to spread beauty, good harmony, to educate people and to raise them above the routine. I believe that those who say this type of view is behind the times are wrong. The ideals of human kindness have remained unchanged over many thousands of years, the foremost being love, truth, freedom and friendship. To serve them is not a step backwards”. Amen to that! It is also noted that Dvarionas believed that an artist’s “individuality is shaped by his national mentality. Thus he viewed Lithuanian folklore as “a key tenet of his artistic heritage” and that is indeed apparent whether the listener is acquainted with it or not since folk influences are evident throughout. The words on the back insert that describe these miniatures cannot be improved upon for they are said to “encompass subtle charm and effortless virtuosity” and all 14 of them show these features in spades. The duo on the first disc clearly understand each other very well since they have been playing together for 8 years and violinist Justina Auškelytė has been laureate of the National Balys Dvarionas Violin Competition four times in succession and was Grand Prix laureate in the 8th International Balys Dvarionas Competition in 2008 so she is the perfect vehicle to bring his music to life, which she certainly does, while her colleague, Italian pianist Cesare Pezzi, is such a sympathetic partner that the music is given an extra edge of authenticity and I cannot imagine it will ever be likely to receive more impressive performances. Turning to the second disc it was fascinating to read violinist Piet Koornhof’s booklet notes which he begins by explaining why he seeks music “that is off the beaten path” giving the reason as both wanting to “share the freshness of new discovery” as well as the fact that he feels that recording yet another performance of a work from the standard repertoire would add nothing new to it. If I change the word performance to piece of writing then his motivation for seeking out works such as those on the disc are much the same as mine for choosing to review those discs I do. I like to write about the music as well as the performance and what else is to be said about Beethoven’s 5th Symphony or a Schubert song that hasn’t already been said by many who are more eloquent than I? Piet Koornhof writes that all four composers on his disc “share a fundamental conviction that music has the power to transcend suffering and heal the human spirit” which reinforces Dvarionas’ message quoted above. That conviction is certainly fully in evidence in all the pieces here and is what makes them so attractive to the listener. Both Koornhof and Thomas Hecht are excellent conduits for the music of Balys Dvarionas and coming straight after the previous disc it is difficult to choose between performances, except to say that Justina Auškelytė and Cesare Pezzi bring a youthful freshness that edges theirs ahead just a touch. The second composer on their disc is Georgian Giya Kancheli whose music is finding much greater exposure than hitherto and deservedly so for it is quite unique. Piet Koornhof, in his booklet notes, quotes from each composer about what motivated them to write music and I have already quoted what he uses to illustrate Dvarionas’ ideals and similarly Kancheli is just as profound when he says “A force of invincible beauty towers above, and conquers, the forces of ignorance, bigotry, violence, and evil”. His piece entitled Time...and again is a wonderful and ethereally beautiful work that expresses feelings of nostalgia and loss in the most unmistakeable way. It is an incredibly powerful work and there is a luminosity that shines within the music which I found made my hair stand on end with its hugely effective evocation of those feelings he seeks to describe. Beauty is another key feature of all the works on this disc and that is illustrated in Peteris Vasks’ fabulous piece Music for a summer evening for solo piano which evokes the quietness of the end of a summer’s day and which incorporates some echoes of folk music which further enhance the feeling of timelessness. It is the most satisfyingly relaxing work I have heard in a long time which chimes with his declared aim “to provide food for the soul”. I was privileged to meet the composer last year at the Vale of Glamorgan Festival when I heard his 3rd string quartet and since then have sought out his music at every opportunity. Arvo Pärt is by far the most renowned composer from the Baltic States and his unique tintinnabuli style of composition which as he says “evokes the pealing of bells, (their) complex but rich sonorous mass of overtones, the gradual unfolding of patterns implicit in the sound itself, and the idea of a sound that is simultaneously static and in flux” has lead him to compose music that holds a special place in contemporary culture. Fratres (‘brothers’ in Latin) is undoubtedly his best known and most often repeated work which has since 1980 been adapted for a huge variety of different instruments and ensembles and now exists in no less than 17 versions as diverse as the present and original version to one for 3 recorders, percussion and cello. The fascinating thing is that it works in every case and reveals different elements in each. 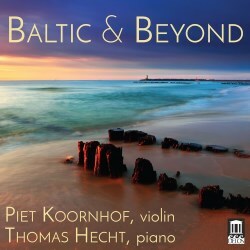 The duo of Koornhof and Hecht bring this music vividly to life in sympathetic performances that serve it well and anyone who, like Piet Koornhof and I, relishes new discoveries will find that both these discs exemplify all that is best in music from the Baltic and beyond.